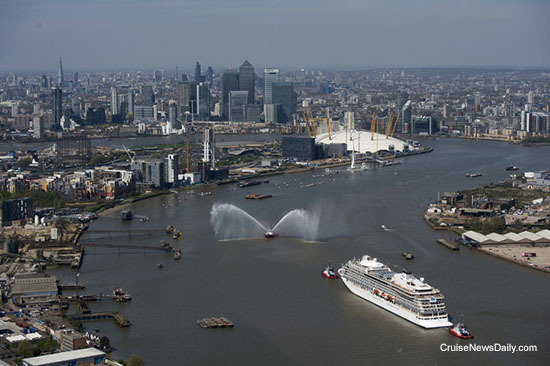 Viking’s second ship was christened yesterday in London, an unusual location for such an event, but Viking Sea at just 47,800-gross tons, had no trouble navigating the Thames, and became the largest ship ever named in the British capital. 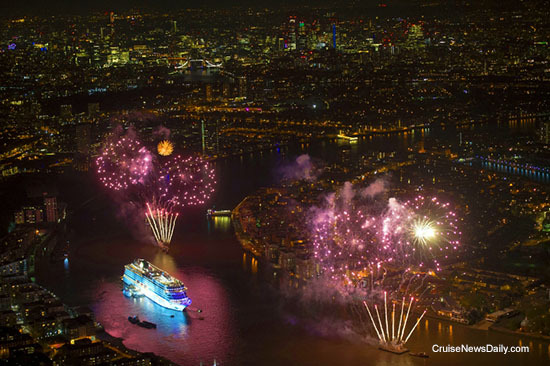 The ship was christened last night in the Thames by Karine Hagen, Viking's senior vice president and daughter of the line’s founder, Torstein Hagen. Photos courtesy of Viking Ocean Cruises. All rights reserved. May not be copied or used without express permission. Carnival Cruise Line canceled calls at Izmir (Turkey) through June 19 due to security concerns. Today was the opening of the Alaska cruise season in Vancouver. Three ships brought 13,000 people into town, and the pace will continue through Sunday. By then eight ships will have visited. A homeless shelter in Ketchikan reports they will have a $14,000 shortfall in their budge because cruise passengers keep stopping in, drinking coffee and eating their snacks. The shelter doesn't charge, but would like the visitors to at least leave a donation. A couple of weeks ago we reported that CLIA was suing the City of Juneau for misusing the head taxes they collect from cruise passengers whose ships call there. The city has been served, and they’re going to fight it - and you won’t believe how. Norwegian Cruise Line Holdings signing a new contract with EMC to quadruple the bandwidth they provide to passengers for internet service. The new lightning-fast service will be available on all three of the company's brands by July. AIDAprima will be christened in Hamburg on Saturday night with coverage provided on the internet. 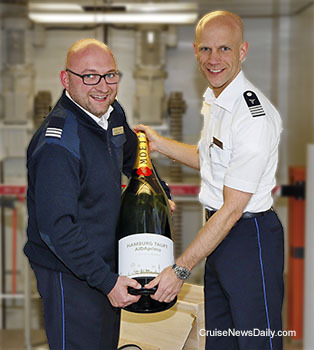 It will be christened with a 12-liter bottle of Moet & Chandon's finest. A photo is below. Beginning in December, Princess passengers are going to have a new choice to make when the line debuts their new Club Class Mini-Suites. The new category will be some of Princess’ spacious and comfortable mini-suites set aside for the new class with a number of new services and amenities added that bring them closer to the types of services Princess offers to their full suite passengers. It will be ideal for people who want many of the services of a suite but only need the space of a mini-suite. Sound of brakes squealing! Wait a minute. Carnival came up with a better idea. After announcing their plans to enter the China-sourced market in 2017, and then a few weeks later in February rethinking it and delaying everything a year, Carnival Cruise Line has rethought it again and decided on a new plan. This summer Crystal will move into another new area of the vacation experience when Crystal Mozart enters service. The luxury river vessel will bring Crystal standards to European river cruising. The line this week released design details for the vessel which will go into service on July 13, sailing round trip from Vienna. Royal Caribbean finishes expansion of VOOM internet service fleetwide. The word "barbeque" will soon create a panic on Costa ships. Adam Tihany, the interior architect of Holland America's new Koningsdam, continues his discussion of his theory of design in the video below. Viking Ocean Cruises is just about to christen their second ship, but today they already announced what their fourth ship would do for its inaugural cruise. 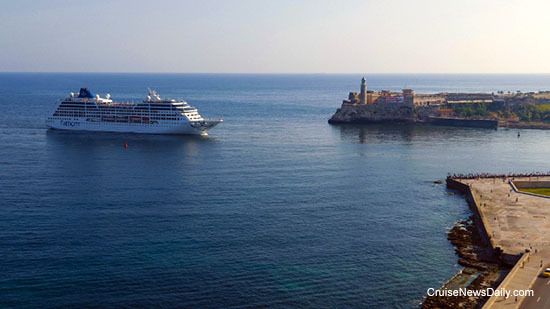 Viking Sun is going to sail a 141-day world cruise. It will be Viking’s first-ever world cruise. The ship will sail westward from Miami and end in London almost five months later, and along the way it will visit five continents, 35 countries and 66 ports. In 12 of those ports it will spend the night. 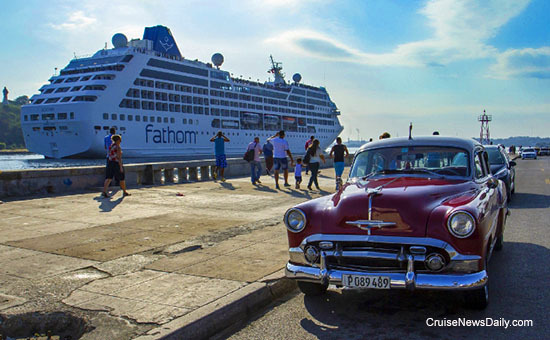 Fathom’s Adonia sailed from Miami yesterday on its first cruise to Cuba, the first by any American-based ship in more than fifty years. 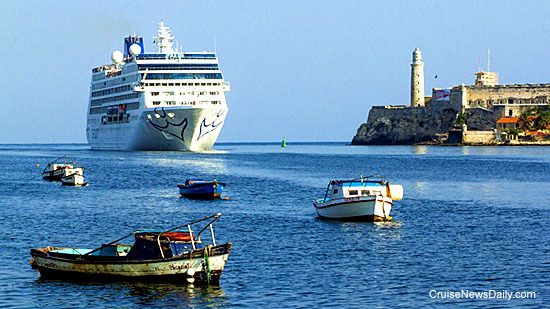 As advertised, it arrived in Havana this morning, and the first modern American cruisers disembarked and began seeing the city and meeting the people. Photos courtesy of Fathom Travel. All rights reserved. May not be copied or used without express permission.